The coronation ceremony began with the dressing of the emperor. The coronation mantle was the focal point of his coronation vestments. It was worn, of course, with special gloves, shoes and socks. The coronation mantle, also called the Pluviale, was worn, not like a regular coat, but was turned 90 degrees so that the opening was usually on the right shoulder so the right arm could hold a sword, allowing greater freedom of movement. The mantle was weighing 11 kilos. It was far more than a piece of clothing. It represented an insignia and later became a relic. The coronation mantle was made from Byzantine silk, embroidered, 3.4 meter wide, and weighed 11 kg. The coronation mantle came to the Holy Roman Empire through the politics of marriage. It was originally made for the Norman, Viking, Roger II. 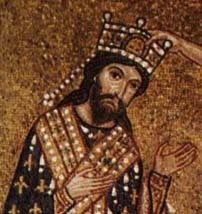 When Roger conquered Sicily in 1133 AD, he was crowned king there and commissioned his royal workshop to make his coronation mantle. Rogers' daughter Constance married Henry VI. in 1186. Henry VI. was the son of Frederic Barbarossa. In time, he left his wife and son (Frederic II). His wife Constance and his son had to stay in Sicily. Henry returned to Germany and took the coronation mantle with him. When Constance died, Sicily became part of the Holy Roman Empire. 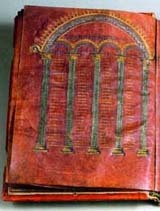 As a result, the Norman coronation treasure came to be the property of the German imperial family, the Hohenstauffer. Frederic II., the son of Henry and Constance, grew up in Sicily and was educated by Muslim Kadis and Latin teachers. When he was 14 years, he was orphaned and went to Germany, to declare that he was the prince and took over the power of the throne. Frederic II. spoke several languages, and loved to hunt Falcons. He wrote several books on the subject. On the occasion of his coronation in 1220, he made the coronation mantle a permanent component of the imperial insignias. Forty seven rulers that followed him carried it in their coronation ceremonies up until the 18th Century. Frederic II. is buried in Palermo, Sicily. The semicircular mantle is embroidered with gold threads made into a tapestry showing lions triumphing over camels. The center of the mantle shows a Tree of Life, utilizing a stylist palm tree with pendants of hanging fruits. Its displays a Tree of Life, that utilizes a stylist palm tree with a pendant of fruits. The occidental interpretation would signify the triumph of the Christians over the Pagans. But the origins of these symbols are to be found in the interpretations of the great Persian kings. Representations of a victorious lion over horses, camels or cattle can be traced to the palace of Persepolis. The emperors later transferred these sovereign representations to the Holy Roman Empire. 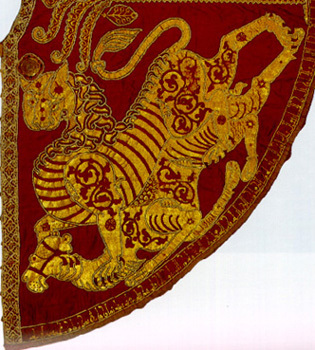 The embroidered roses on lion show the constellation of Leo, as it is explained in astrological terms from the year 1225. It is a further eastern tradition: the emperor dressed in a "sky-mantle" - symbolising his power which was given him by god. The roses on the camel are to be viewed as purely decorative, as no camels appear on the astrological globe. 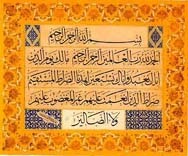 The hem of the mantle is decorated with an Arabic (Kufic) inscription, bordered on both sides by a double row of pearls. It is to be read from right to the left. The text reads: this belongs to the articles worked in the Royal workshop, (which has) flourished with fortune and honour, with industry and perfection, with might and merit, with (this) sanction and (his) prosperity, with magnanimity and majesty, with renown and beauty and the fulfillment of desires and hopes and with felicitous days and nights without cease of change!, with honour and solicitude, with protection and defence, with success and certainty, with triumph and industry. In the (capital) city of Sicily I the year 528. The monarch thus hymned is the Norman king Roger II. The coronation mantle, although it originated in the Islamic culture, was used in the Holy Roman Empire. It has not only has high materials value and the value of the fascinating work which was done, but also the outstanding manner in which the colors have survived. What is most impressive is the way this piece of art has survived the centuries in such good condition after nearly 1000 years. The Indigo magenta color that was used in the mantle, is the oldest color which was used in textiles and books such as the coronation evangeliar. Whenever the mantle was transported, pearls came loose and were often lost. They frequently had to be replaced and sewn onto the mantle. This happened frequently during the coronation ceremony itself. Today, the original sewing kit and needles still exist and are used by restorers. The holes in the pearls were so tiny that today's needles cannot be used. No one knows how the holes in the pearls were drilled, but it is suspected that pig bristles were used to thread them to the fabric. The mantle was last restored in 1987. The mantle is completely lined with a pink linen fabric, which is overlaid with three other materials. The oldest fabric originates from the time of the mantle itself. Some fabrics became worn and had to be replaced - the last time in the 18th century. On the occasion of the coronation of Frederic II., (1220 AD) other pieces of clothing were made, particularly a pair of gloves which were made in Palermo just prior to the coronation. These gloves have a tremendous symbolic value. They are often referred to as "Pontifikal-(Pontiff's) Gloves. Pontifex means Bridge-builder. The Pope is symbolically a bridge-builder. He builds bridges from humans to humans, from humans to God and from religion to religion. In those times, the emperor was nearly equal to the Pope. The presentation of a glove had many meanings. It served as a pledge between the knights and the aristocracy or end the allegience by throwing the glove back. Throwing a glove down at an enemy's feet was a challenge to a duel. 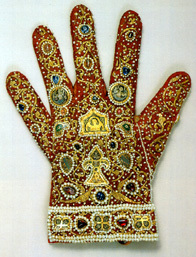 This glove is also the work of Greek-Byzantine silk weavers. King Roger II was permitted by the Pope to carry these special shoes and a Mitra. It is assumed that the shoes were made in Palermo at the same time as the mantle. Because of the varying size of emperor's feet, the shoes were often reworked. 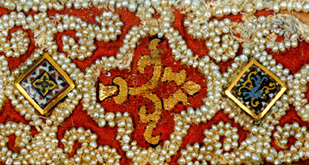 The current form originates from that 17th Century.The material is richly embroidered with pearls. The original socks were made from leather and in time were made longer, rising up to the calf. 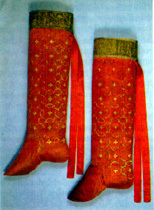 These became part of the coronation garb in Palermo. 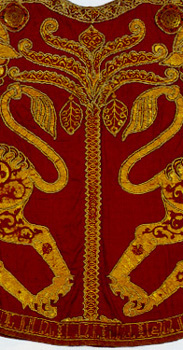 Magenta-colored silk with gold embroidery, was woven along the edge of the socks using a tapestry technique. The red silk ribbons, which held the hose, were added later. The magenta color could only be used by the emperor. When Byzanz was taken in 1453, the only way it was known that Basileus (emperor of the East Roman Empire) had been killed was by the magenta color of his socks.